I broke my feet in two places but I am still in pain and burning. It happened 2 years ago. I am not diabetic and I don't know what I can take for the burning and pain. I was rappelling down after a good ascent and while rappelling down the piton gave way a few meters from the ground. Weighing at 91 kg I fell on my foot, the left contacting the ground before the right. I did hear a loud enough cracking sound with a sharp pain which told me clearly it was broken. I removed my shoe and saw my little toe bent upwards out and so pulled it back into place. The swelling started as well, I felt about my small toe in line with my small toe and towards my foot I felt the area and it was broken. My 1400 pound steer stepped on my foot 2 years ago. And my foot is half red and half white, and I can't bear weight. The x-rays show nothing but still I can't move my toes and the swollen foot keeps getting worse. I am worried the foot is broken. I broke my foot in a rock climbing accident. I fell about 20 ft. and landed on my feet. I was in my 20s at the time. Now at 55 I keep having issues with both feet and can hardly walk. It comes and goes. I fell down my outside steps to basement. My foot hit the wall and the fifth metatarsal snapped five weeks ago. I had an avulsion talus fracture in my foot almost a year ago. I now have a lump, popping and ongoing dull pain. I jumped from the top and got a fracture in my heel bone. I broke my foot kicking the door and now after 6 months I have pain in the Achilles tendon. I broke my foot when my 180 lb. dad and his walker fell on my foot. He landed on my foot right below the joint of my big toe and the two beside it. I kicked a wooden fence down when I was so drunk, I don't even remember it happening. My friend said I kicked a wooden fence so hard a large part of it actually hit the floor and I couldn't walk, so some random guy carried me all the way back to my friend's place. I woke up the next day in excruciating pain and I could not remember a thing. The pain was so bad I could not walk. And for some reason I refused to go to the doctor and I spent the next 2 years unable to walk properly, I was limping for literally years. Now I'm 27 years old and my foot looks different and hurts regularly. It looks like I have 2 ankles and there is a large lump on the side of my foot just below my big toe and it is just not good. I have trouble wearing nice shoes or enclosed like sneakers or running shoes. Anything other than a pair of thongs is painful. Back in the 90s I had a car accident. My right foot was pushed under the gas pedal and a small triangle piece of bone was broken off and left floating in the foot. Because the x-ray could not see the bone because of swelling nothing was done. Years later, the pain in the foot necessitated another x-ray and the bone was seen. Now I am older and walking is now painful in this foot and it is very swollen by the end of the day, I am not sure what can be done now, after all these years. I fell 10 feet off a ladder landing on my feet breaking my heel in my left foot and crushing my heel in my right foot. For 3 weeks I had cast, now I'm in the walking boots, but not allowed to put any weight-bearing on either foot. I sleep with them off. I jumped off of a bar wearing high heels and broke both feet instantly and was unable to stand. Two metatarsal bones broke in the right foot, and I was put in a boot for 4 weeks. The navicular bone in my left foot was shattered but not displaced, and was put in a cast for 4 weeks, no pressure on it for 6 weeks. I only took Tylenol, lots of vitamin D and calcium supplements help tremendously. I am going on week 5 now, and other than being frustrated at the crutches and not being able to do normal things for myself I feel like I'm healing really well. A large heavy old style TV fell on my foot and broke my foot. I missed a step going to the basement and fell with all my weight on my left foot. I had lots of pain. I was home alone so walked back upstairs to put ice on it. Next morning I knew I needed x-rays, so I went to Urgent Care and was diagnosed with broken and displaced 4th and 5th metatarsals. The following day I went to an orthopedic doctor who said I needed surgery. I ended up with plates and pins on both bones. I have a cast up to my knee and am non- bearing. It has been 10 weeks but I will hopefully get the cast off in 10 more days. What a hassle to be on crutches for all this time! After that I'll be in a boot for a while. Moral of the story, hold on to the railing at all times and don't rush down the stairs. I was just diagnosed with two fractures in my right foot, the intermediate cuneiform and the second metatarsal. I did not injure it by accident or dropping something on it but most likely from years of small stress fracturing that never healed due to years of arthritis and the cuneiform finally broke from top to bottom. Not fun. I had MRI and now getting a walking cast for 4 weeks, heavy doses of vitamin D sublingual per doctor's advice and will then x-ray again to see if it is healing. If not, I am not sure what the next step will be. I broke my foot just stepping up on to my wooden deck porch, not hitting anything, just pushing off like you normally would to get up a step. I have a second metatarsal bone broken in two places on my right foot. I never injured it before this, it just broke. I have never had a broken bone before. I had a boot cast but it is not healing very well. Doctor said it is strange looking and put me in a non-weight bearing cast. He also said if it doesn't heal in the next 4 to 6 weeks they will have to do a bone biopsy or plate and pin it. My toes are numb and part of my leg too, and he said I need to see a neurologist for this. I'm confused as to what's going on. I was walking down a flight of stairs to get to the metro platform and missed a step and the next thing I knew I was down. I knew I sprained my ankle but didn't know about the broken bone until I went to see a podiatrist. I am in a boot and I have multiple fractures of the 5th metatarsal, with part of the bone sliding underneath the other part and some bone fragments they can see on the x-ray. They are waiting for the swelling to go down but they will need to operate and insert a plate and have told me it can't be repaired 100 percent. I was standing sideways on my front steps, leaning over the railing to put Christmas lights on the bushes. The foot closest to the edge of the step suddenly buckled under and I fell down the steps. I clearly heard bones breaking. X-rays showed no fracture, but due to the swelling, the doctor ordered a CT scan which showed the navicular bone was broken into 3 pieces and the cuboid bone beside it was cracked in half. I am in a boot and supposed to be non-weight bearing for 6 to 8 weeks. It is very painful. I got up in the middle of the night to use the bathroom, and on my way back to bed, I slammed the top of my foot into and under the base of the treadmill and broke my foot. On August 20th 2015. I received some disturbing news while at work. I ran down the stairs, somewhere midway the stairs I fell. I remember my foot twisting over. I felt a pain as if I had bumped it hard possibly on a stair step. I got up, tried to continue running, but I was limping. I continued to work but limping, as I thought I'd just twisted my ankle or had a sprain. Of course being at work I had to go to the emergency room. I was x-rayed and informed that my foot was broken. I was given a boot to wear the next day after going to the orthopedics. I was informed that it will be six to eight weeks. It's now been three long weeks. Helping my next door neighbor fix his guttering, I slipped and fell 6 ft. on to the concrete and broke my foot. I am 6 weeks off work minimum, ouch! Walking away from a bin lorry after loading it I was struck from behind as it reversed, trapping the foot by the Achilles heel and the ground, the force great enough to snap four bones mid-way. For several weeks I had sore left foot, and ignored it. Dumbly, I walked on the treadmill as a new gym member and foot swelled 10 times. Still did not know anything was wrong or see a doctor (on hindsight this would have been a good time to at least have had it checked out). Within one week, I was simply walking home (I live in the city) and had on women's shoe boots; they were unzipped due to feet hurting. Walking home I went a slightly different route, and simply turned a corner, an unfamiliar curb; I have no idea what happened, my left ankle turned in or out, and the right foot lost balance too, off the 5 inch curb I went. I remember falling, it felt forever, and boom to the ground. Strangers ran to help me and gather my papers strewn in the street, they helped me up, or tried to and I knew something was broken. The pain was blinding and I could not put any pressure whatsoever on either foot. Long story short, emergency room said they were both broken and then followed up with orthopedic surgeon 3 days later and he confirmed both feet had been fractured. Left on the fifth metatarsal and right foot metatarsal 3. It's been almost 3 weeks and now left foot heel is really hurting as well. I just have to accept that time only will get me back to normal. I had a couple of drinks and jumped down the stairs. I landed bad and heard a snap and I just knew. I broke my foot in 2 places and sprained my ankle. I am on day 3 of healing and let me tell you, I'll never jump down the stairs again. I dropped a wooden beam on my foot, I believe I've broken or cracked the proximal metatarsal bone. On the first day of my trip to Thailand, I rented a bike and while driving, the bike started wobbling and I fell down. While I got a sprain on my left hand, I got cuts all over my right hand and a deep gash on my right knee. While I tried to stand up I fell deep pain in my right foot and the more I tried to stand, the more it pained. I drove back to the hotel and immediately went to sleep. I woke up with a swollen foot in the evening, which made it clear that I had broken a bone. So I did not get down from the bed and went to the hospital the very next morning. I was diagnosed with a broken 3rd metatarsal and got a cast on my leg at the hospital with a 2 month recovery time. I walk with crutches now, if I have to, otherwise I either sit on my chair or rest on the bed. Today is Day 17. I have five broken metatarsals. Only one was caused by trauma, the other four have occurred just walking my dogs. The last three have occurred in the last year. I've purchased special shoes with custom orthotics and the last break occurred in those shoes. Bone density shows typical osteopenia for my age and gender. Nutrition has been improved greatly over the last year, but what can an old gal do! I broke my right ankle in a car wreck. I realized it was broken when I tried to walk and couldn't walk on it and it started swelling and hurting also. I've had two surgeries and came home, it's been about almost a week and a half of my feet still give me problem. It's burning and itching and I'm in pain plus it is swelling. While on an outing at a waterpark I had sat down, and when I got up I took a step I kicked the heavy lounge chair leg with the second step and connected with the baby toe. I went for an x-ray and it was broken. I had 'buddied' the toe and that is the treatment plus a nice soft low boot. It should be healed in 4 to 6 weeks. There is no swelling, much bruising, and some pain the first 2 days. I thought there would be much pain and I could walk on the foot but not on the little toe, I lean to the inside automatically. Going down my front steps, I stepped on a large stone with my right foot and it rolled out from under me. Luckily I was holding on to the hand rail and kept a firm grasp. However my left foot on the higher step and behind me turned upside down and took the brunt of the pressure. The area behind my great toe is painful, red and swollen. I know when I broke a toe they just said tape it, that's all. I broke my foot taking a bad kick hitting top of the foot. I am following RICE (rest, ice, compression and elevation) right now. I broke my foot in the last 2 minutes doing a job on ladder approximately 20 foot up. Ladder kicked, down I came, heel hit ladder rung with heel then crack... I've broken my heel and badly hurt my back. I rolled my left foot while jogging, and tripped with my right at the same time, so all my weight went onto it. 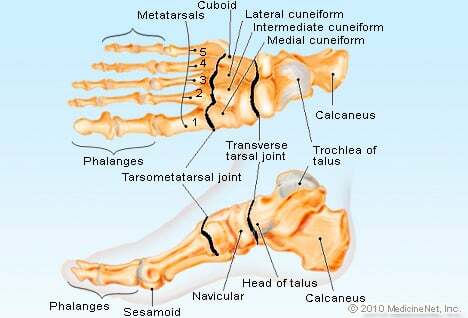 X-rays revealed a fracture of the 5th metatarsal. In a motor vehicle accident 2 years ago right foot mid-foot down to the toes were crushed, but I had a fracture blister form on my toes 3-5 days later. Doctors drained the blister, it got infected, hasn't healed yet, and I still can't walk. I broke my foot while surfing, when my right, front foot hit the surfboard with the top of my foot. My husband has a bad habit of leaving his shoes right in front of the door. This time he left them at the back door that steps down into the porch, so I stepped out, landed right into his shoe, and down I went! I had 2 fractures of the big toe and a mid-fracture of the 5th metatarsal. I am still getting used to the crutches, today is day 2. I'm 46 and this is the first time I've ever broken a bone, can't say I'm enjoying this. I slammed on the breaks of my car and rear ended someone. I hit the brakes so hard with my right foot and then walked on it for about a week. The pain was excruciating. The doctor and the nurse couldn't believe I walked on it. I had broken the bone which is on the right side of the foot and also broken the second toe. I had to have a cast to my knee and they could not put a cast on the toe and had to wear the boot. I broke my foot running. I am a regular runner but was taking a long run and ran through the woods and over some uneven ground, flexing my foot a bit as I went over roots and rocks. A mile or two later the middle top of my foot started to ache. To play it safe, I walked home. After 24 hours of ice packs it was still swollen and starting to turn red. I did not believe it was broken, but it was more than stress-fractured, it was broken and displaced! No attempt was made to set it. I was just given a boot to wear and told not to lift any weight for 1 month. It is healing well, especially, they said, because it was the middle metatarsal. I was surprised that it barely hurt, it just ached a bit. Without the precautionary x-ray, I would not have ever believed it was broken. I missed a step... Five bumps down the stairs later I had terrible pain in my foot with lovely colors of blues purples. My husband took me to the emergency room and I had an x-ray, which showed the broken bone. They "gave" me a cute little black boot, which helps some. The best therapy is rest, ice, and elevation. I expect to be well by October 1! I hit the footboard on bed and then fell at night. I was on vacation so didn't seek medical attention until I got home. It's been six weeks and my foot is still swollen and painful. I have been using rest, ice, elevation and recently a stiff shoe. It has been months since I accidentally dropped a weight on my foot. At the time I thought I probably broke my foot. There was no external sign at all. Since then, it would start hurting more when I walked, so I would limp to keep weight off of it for a week, and it would seem to get better. Then I would repeat the cycle, get on an exercise bike, and it would start hurting again. Just this weekend I carried a heavy box to my car, and it started hurting more than ever. I can see the hint of a red line on my skin, and a vein is popping out just above the hurt. When I raise my foot, some of the (slight) pain goes away. I think it might have a tiny internal cut way beneath the skin. I have read that it might take 4 to 8 weeks for this to really heal, so my plan now is to limp around the leg as much as possible, and stop any load bearing activity during that time, whether I need it or not. If that doesn't work, I guess I have to see the foot doctor. I dropped a piece of wood on my foot and broke it. I had foot surgery to fuse my big toe with the metatarsal to relieve the pain from an arthritic growth. That seemed to be healing fine. About ten days later my foot swelled considerably and the sign turned red. X-rays showed that there was a fracture of the second metatarsal. My doctor tells me to wear an Aircast boot which I wore after the surgery. I dropped a large can of pumpkin on the top of my foot. There was no blood but a lot of pain. I hobbled around for a few days until the pain subsided. It still hurts from time to time. I fell off a 3 story house broke my heel. I missed 1 or 2 steps, not sure if there were 2, fell down and broke my foot. I was very drunk and fell over on my heels when the song 'Get Low' was on. While walking I heard a snap like stepping on an acorn; two middle toes were black and blue and I had pain in middle of foot. I just woke up one day and had sharp pain in my right foot, had an X-ray done to find fracture in there Metatarsal bone. I did not have any impact nor there was an excessive force on the foot then I am unable to understand how this fracture has occurred. I missed a step, turned my foot, and went down.